Preschoolers and toddlers need similar food to grow. A dietician advises. Even though, the quantities of food that preschool children require are larger and the variety of foods they are prepared to accept is greater than in the case of toddlers. By the time a child reaches the age of four, he or she has become a social being. This impacts considerably on food intake. Some of the factors that can influence children in this age group are obvious, others are subtle and may not be evident to anxious caregivers who despair about the child’s dietary habits. For preschool children the family is the primary influence, which determines what food habits the child develops. If significant role models such as a father or older brother or sister express dislikes for certain foods, then the younger children in such a family may well follow suit. Caution the older members of the family NOT to show active dislikes of certain foods such as vegetables or fish, if you want your preschool child to learn to eat these nutritious foods. Once again, it is important to make meal times pleasant and relaxed occasions so that the child can eat in peace without stress or anxiety. Don’t turn your shared meals into battle grounds and don’t humiliate your child by making her sit at the table for hours after everyone else has left, ‘to eat all the food on the plate!’. This is a recipe for disaster and will teach the child to fear meal times and eating. Try to remember that children between the ages of four and six still have small stomach capacities and are physically unable to eat large quantities of food. Rather give them small portions and more frequent small meals so that they can eat the food you offer them without creating stress. Also try to allow sufficient time for the young child to eat his food. It is not his fault that you may be in a tearing hurry to get to work. Putting pressure on children to eat fast can also cause stress and lead to frustrating eating habits. The child may start eating too fast, or even slower than his skills permit, in order to send you a message that he is not feeling happy about rushed meals. This creates a vicious cycle that will make all concerned even more uptight.Preschool children are usually social beings and society can influence their food intake and likes and dislikes considerably. Probably the most important external influence on a young child’s life is television. 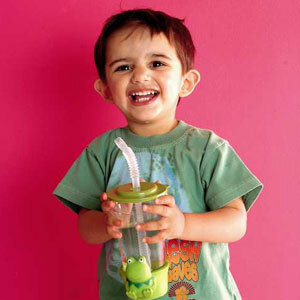 Preschool children watch an alarming amount of TV and are exposed to many advertisements linked to food and beverages. The problem is that young children are highly receptive to glamorous TV messages that are specifically designed to target children. Most of these ads are for foods low in dietary fibre and high in fat or sugar,and energy-rich cold drinks. In addition to the ‘brain washing’ that young children are subjected to when they watch TV, there is the added danger of them turning into couch potatoes. The couch potato syndrome is one of the main causes of childhood obesity. So if you love your child and want to prevent her from developing all kinds of poor eating habits and turning into a couch potato, then limit the amount of time she spends watching TV. It is such an easy option to have your child ‘baby-sat’ by the TV when you are busy or too tired to play games with him, but remember that by allowing him to watch unlimited TV, you are creating endless dietary problems for him and for yourself. In a recent study conducted in the USA, physical inactivity due to excessive TV watching was one of the prime reasons for childhood obesity. So let your children play games and learn to swim and ride a bike. This way, they'll learn to be active for the rest of their lives. Also check what your children are given at nursery school to ensure that they are getting healthy, nutritious food. If the nursery school serves too many cold drinks and sweets and not enough fresh fruit and wholewheat sandwiches with healthy fillings, then talk to the supervisor. After all, you're paying for your child’s care and such care should include healthy food and beverages.